Swooning over this snapshot of a gorgeous lawn wedding by Kate Headley. Wonderfully Gatbsy, don't you agree? As a reminder, my blog and many others will be silent tomorrow in honor of Japan's recent tragedies. I hope you'll join ever ours, Utterly Engaged and For Japan With Love in mourning for their loss and supporting their recovery. I am completely partial to a tented wedding..oooh the romance!!! yess SO gatsby! love it. love the lighting. Love how the glow is captured under the tent. Can imagine it when evening falls! So pretty and romantic, and what a gorgeous house! i originally really wanted a lawn wedding when i first started planning my wedding. 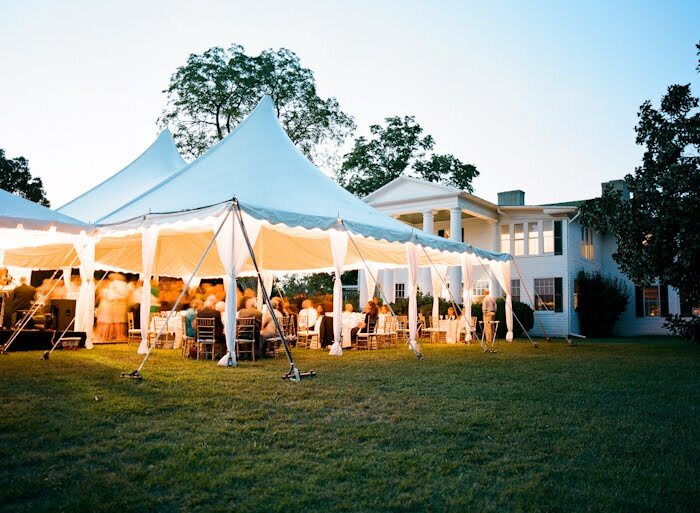 there's just something so charming about big white tents against emerald green lawns! anything that happens in a garden is fine with me! ha! Absolutely gorgeous! So very gorgeous. Swooning for those scalloped edges. Gorgeous! Gorgeous. I went a wedding a tent similar to this one last year. It was so fun and romantic. Ah, a Gatsby lawn wedding was my original dream. Until my Husband informed me he would not be wearing a tux. Wow, it's magical! I bet twinkly lights were somehow involved at nightfall. It is so Gatsby! Gah! I want to have a party there right now. i'm all about the tent wedding/reception! i think this might be my idea of a perfect wedding! Very Gatsby, love! Perfect, too! Oh this is so gorgeous! I'm swooning over it too! Lovely! Beautiful wedding photo; I will be joining in a moment of silence for tomorrow for Japan... Thanks for posting..
oh how lovely - i wish i had a yard big enough to host a wedding. it would be perfection! Have a smashing weekend, lovely. Love the glowing light, so warm and lovely! So Gatsby! Ahh, that was my favorite book I read in highschool. I still rent the movie at least once a year and watch it...and love it each time. And yes, this tent is gorgeous!